Loved the welcome gate. The skeleton dude just gives you that warm fuzzy feeling. 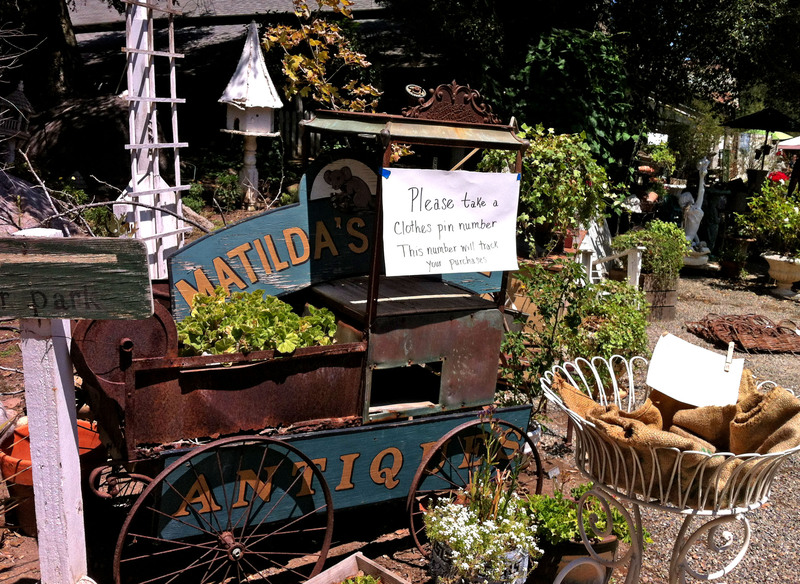 Matilda’s Mouse Antique Show takes place once a month in a barn on the Betty Crocker Estate in Valley Center (29200 Miller Road, Valley Center, CA 92082). It’s a three day event from Friday through Sunday. There’s a theme every month, and October is always Halloween. We love Halloween. 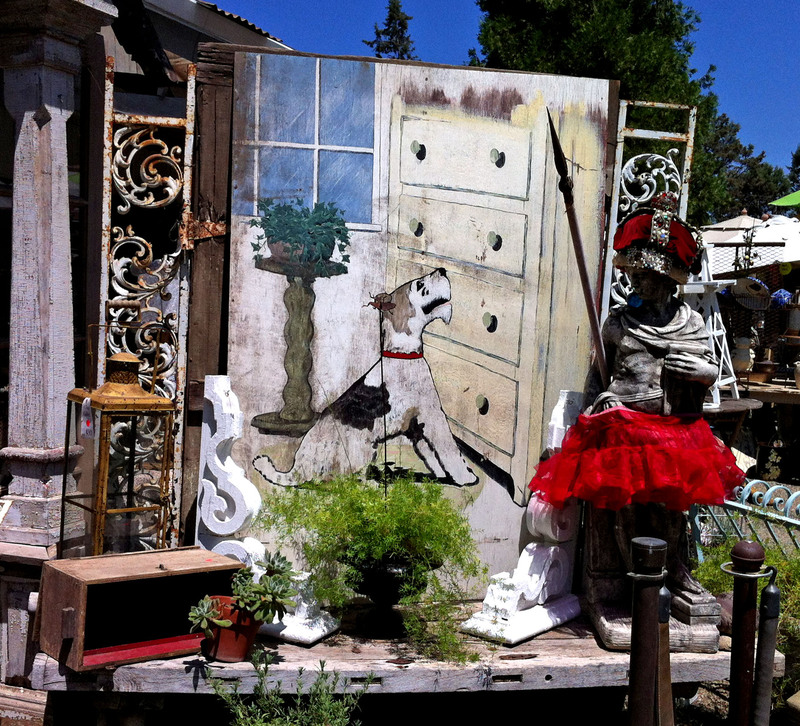 The show has everything from crystal and china, to rusted primitives and architectural salvage. Definitely something for everybody. 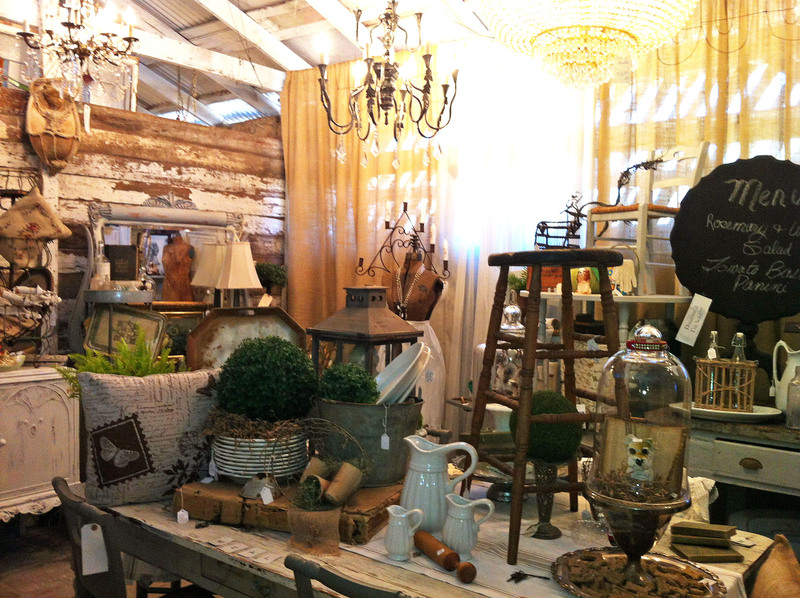 It’s a antique home decor show…….with a twist. I wanted this coffin box bad but it’s not as fun without the three creepy dudes, and I just couldn’t swing the whole group. Their prices are very reasonable, but having just come off a big trip, I’m trying to keep the purse strings tight. 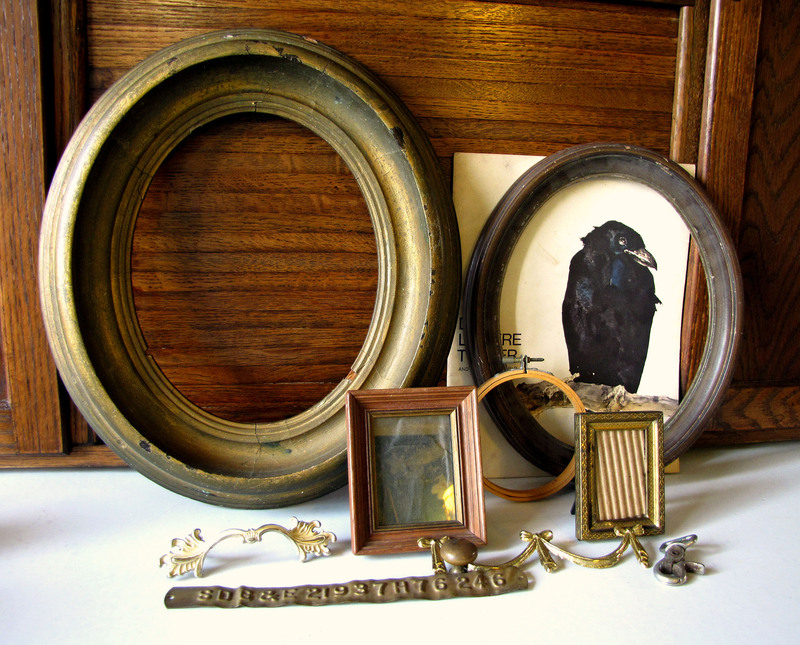 I have a thing for crows and a couple of cool ones did make it home with me. 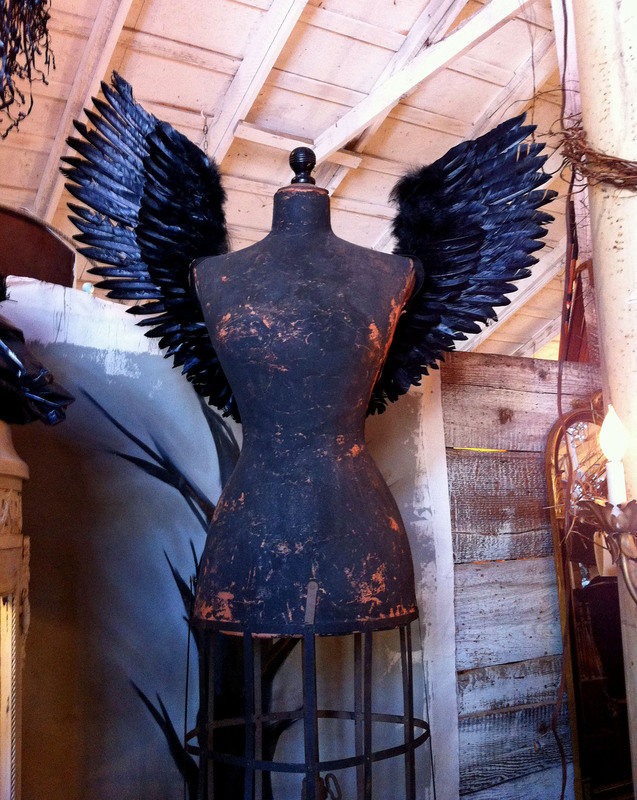 This dress form is fantastic, even without the raven wings. The metal frame at the bottom is in perfect condition. She’d be so much fun to decorate for each season, don’t you think? The women that put this event together are so creative, and the layers are so deep. 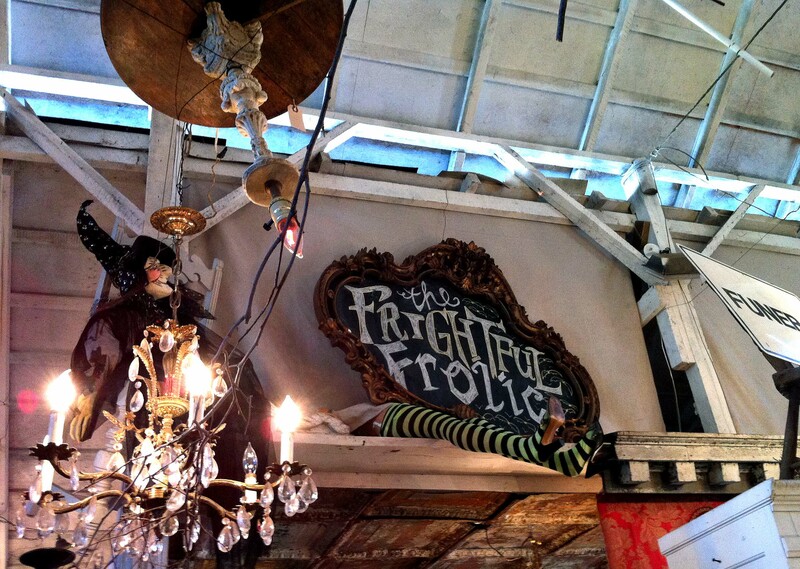 This vignette is hanging high in the rafters. You have to go slow to catch all their ingenuity. 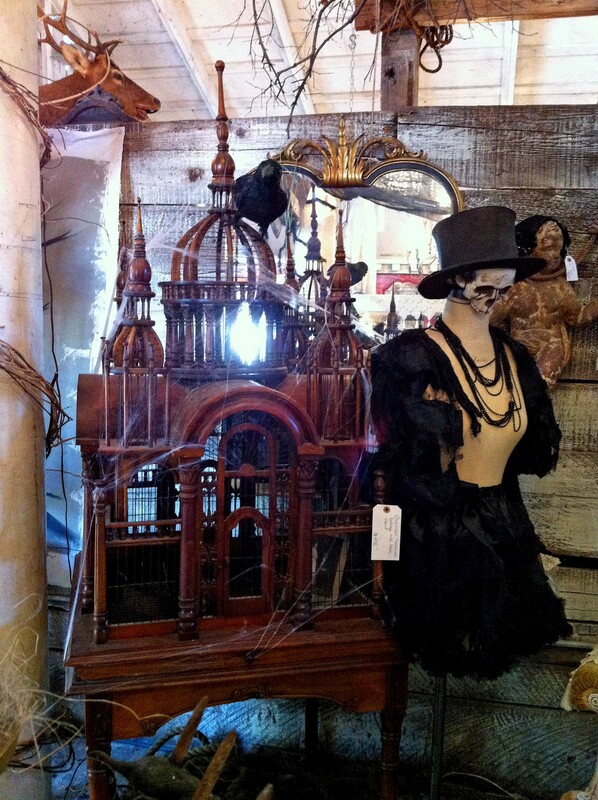 This highly detailed, carved wood birdcage is so beautiful it brought tears to my eyes. I’ve never seen anything like it. 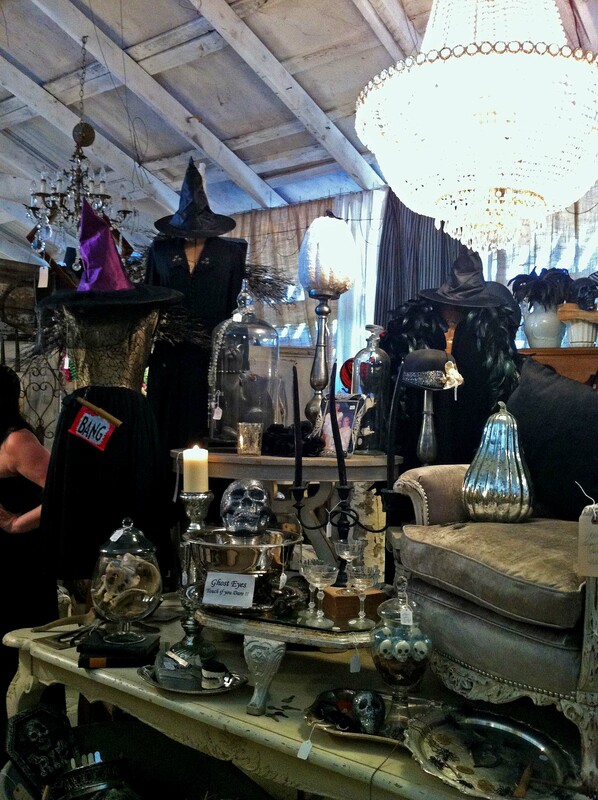 Love the witches legs. 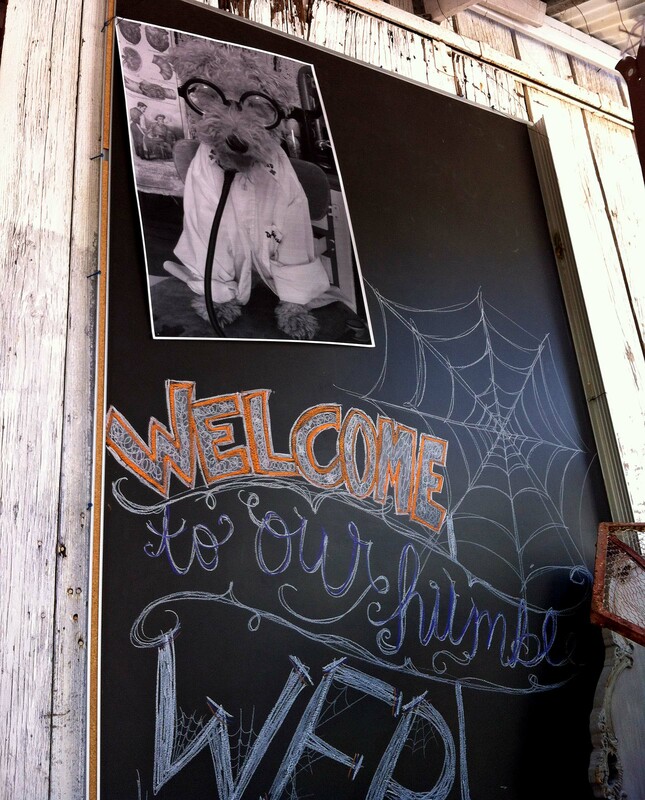 Great job with the chalkboards all around the place as well. 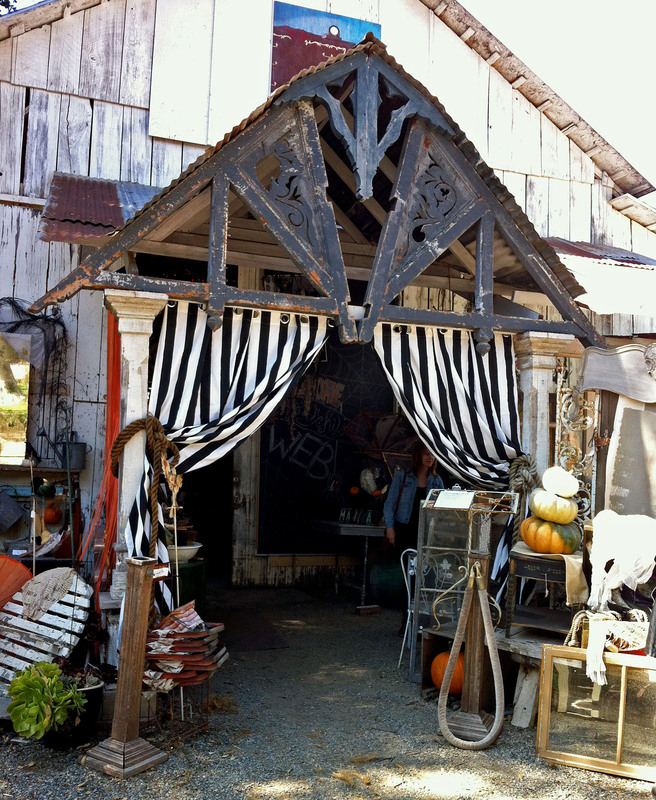 We’re putting our Halloween porch together this weekend and we love going to Matilda’s to pick up a couple new things, but what we really fill up on is inspiration. How could we not? It’s an outstanding show and I can’t recommend it enough. Before the holiday season gets in full swing, take a quick Saturday drive out to Valley Center. It’s a great mother-daughter day out. I know this mother-daughter couple sure had a great time. What are you doing this weekend? This mail organizer is my latest creation…..and I’m in love with it! All the pieces of this message center came together over the last few months. Every time I found another nautical piece I put it in a little pile in the corner of my studio (a clean pile, I swear). Last week I found the final piece at the Mattson Co. sale, so I got to finally put all the pieces together. Ta Da! The brass key rack at the top of this message center was the little treasure I found last week. It’s so patriotic and kitschy, it’s awesome. The fabric I used for the bulletin board came from my friend’s house when we cleaned out her grandmother’s fabric stash. It’s got little anchors and ship helms running across it. The pushpins are covered button and are covered in fabric from my late mother’s stash. The notepad holder is upholstered with vintage fabric, again from my friend’s stash (I brought home so much fabric that it will take me years to use it all up). The notepad holder hangs from a hook screwed into a piece of plywood that I added some hand painted details to. It’s adorable. The pad holder itself is refillable, so you can keep it forever. The mail holder is the piece I love most. I found this book at an estate sale months ago. My daughter and I let out a little squeal when we unearthed it. The nautical symbols on the cover are so graphic and cool, I just had to bring it home. It of course hangs from a 3-ring binder spine, making it portable when you open the rings. I decorated it with red and white cording and a silver crab pendant that I picked up at a flea market. The old camping cup sits on an L-bracket and can hold all your pens and scissors. So that’s my newest listing. Please check out my Etsy shop and pass this post along to anyone you know that needs help getting organized and has a thing for sailors. Have a great Wednesday……..Hump Day! 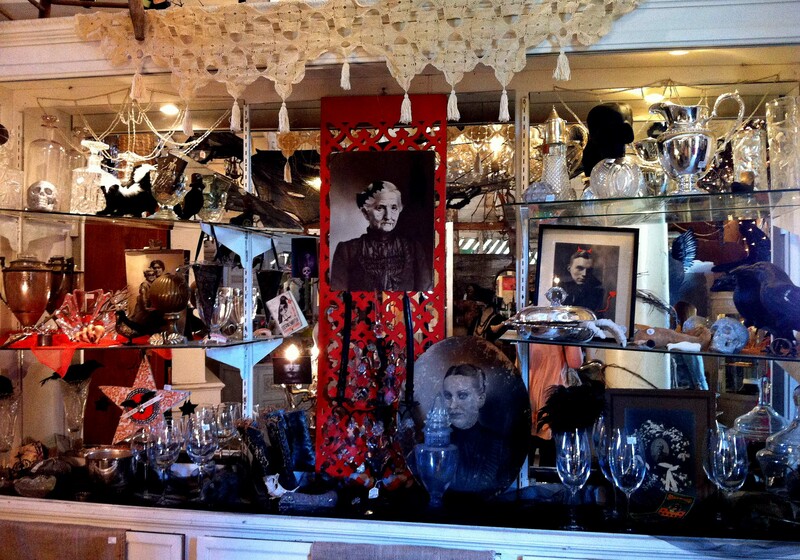 My daughter and I took advantage of her getting out of school early yesterday and wandered over to Mattson Co. which is an estate sale liquidator in San Diego near Mission Bay. We lucked out because they were having a sale…….50% off orange tags, 25% off green tags. This beauty above was going for song……it was a creepy song too…….made you want to hide under your covers. The label on the box kills me, ‘not recommended for children under 3,’ try 33?! She had an entourage with her, of course. 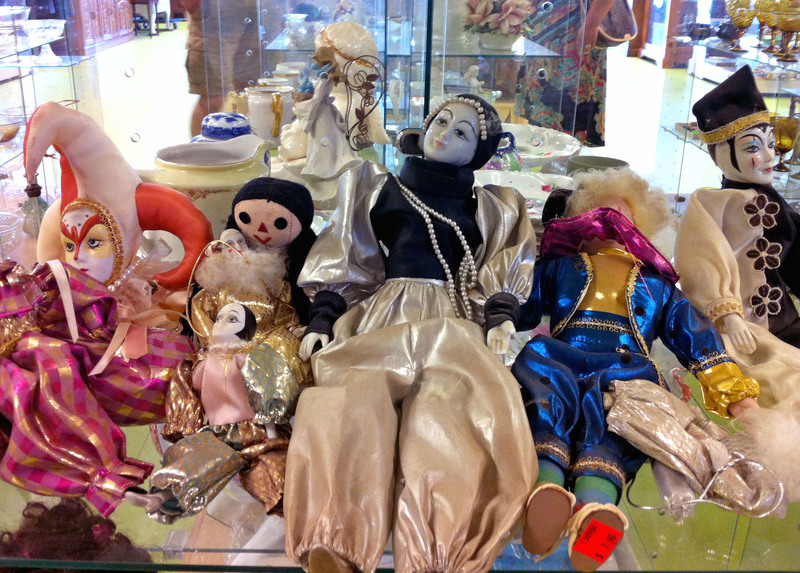 I think the theme here is vintage jesters. 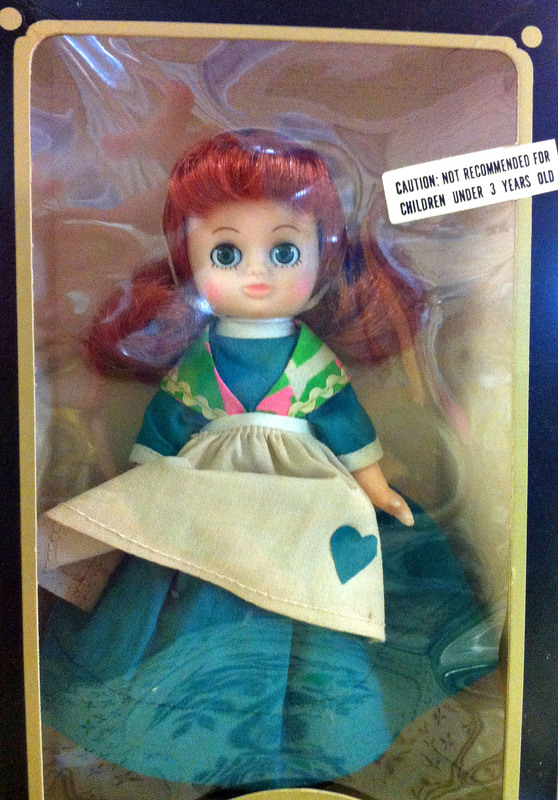 Just want to point out the orange tag on the doll with the blue shiny Aladdin costume and the dry fly-away hair. I resisted bringing him home with me, but he’s probably been snagged by now. Dang! 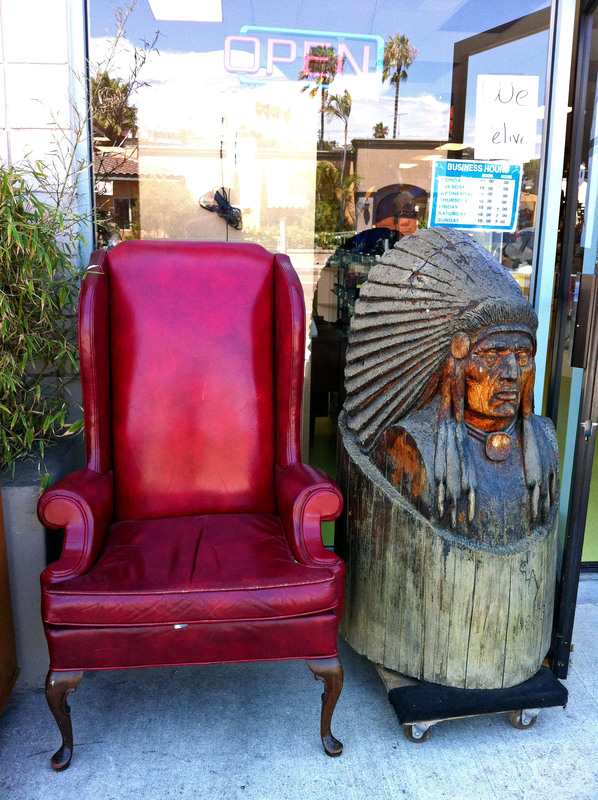 There were a couple of nice pieces out front. 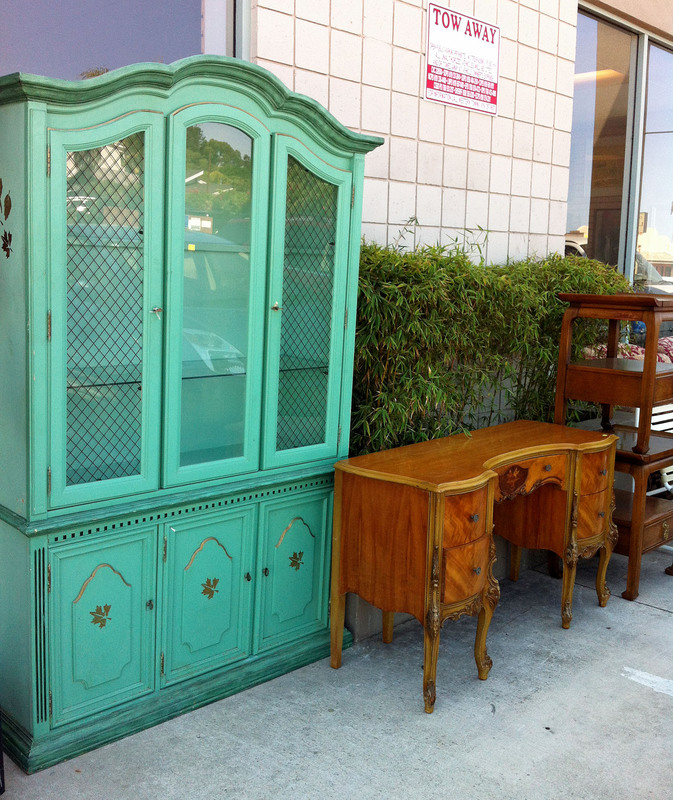 The green armoire is really pretty and in good shape. It had some bad stenciling on the doors but that’s an easy fix. I love both of these but they don’t really go with my stuff. They’d be great additions to a man-cave. 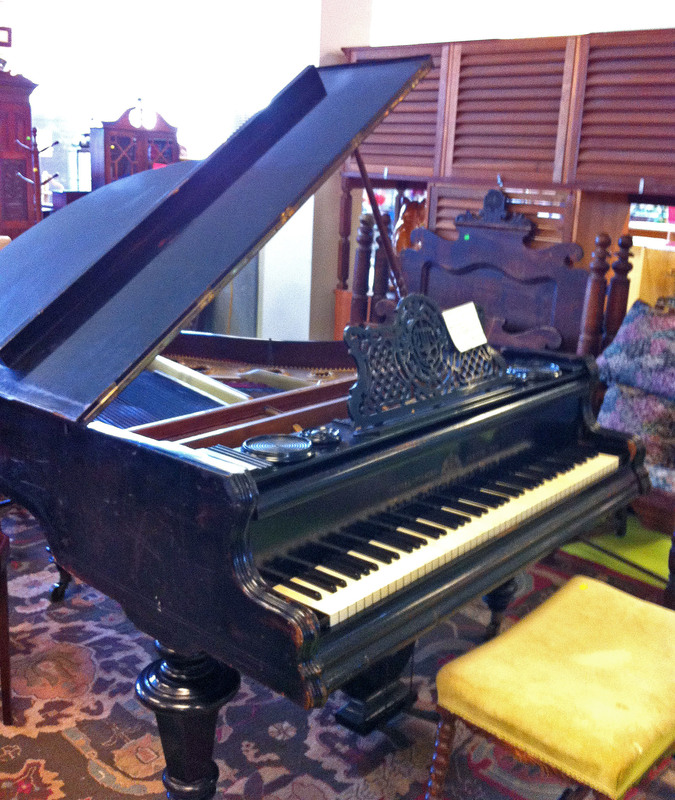 This piano was beautiful. I think I liked the inside even better than the outside. Too bad I forgot how to play, and that I don’t have room for it, and that it doesn’t fit in my car. 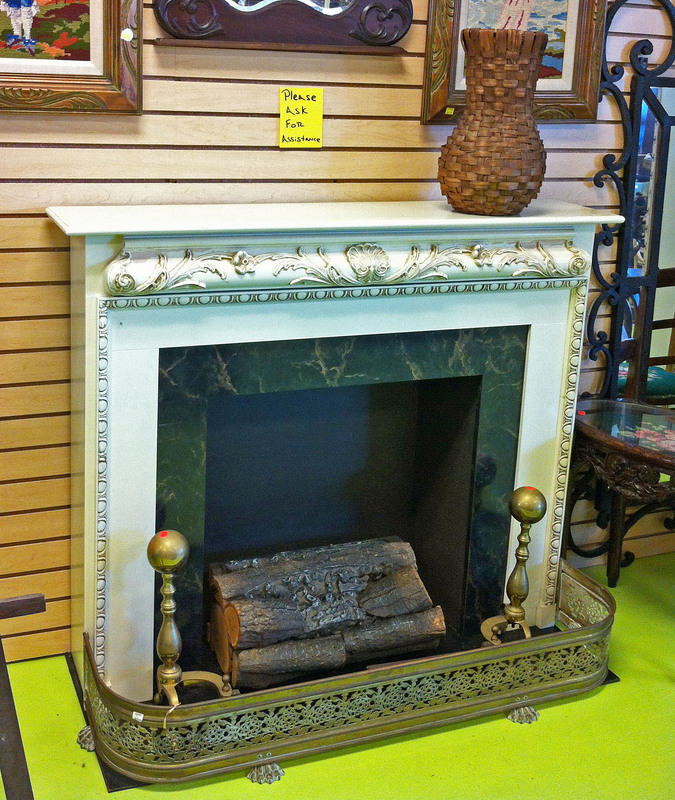 I like both the mantle and the fire screen with the feet. The mantle would be really fun to paint but I think I’d leave the screen as is…….maybe paint the toenails. I think this set of chairs was imagined by someone who wanted their guests to all feel like royalty. It’s a completely bizarre set but I bet the right person could make it wicked cool. If I had all the time in the world, I would be that person, but I know just looking at this set would make my family break out in a rash. Another one for the Widow House. So that’s what we did yesterday…….how about you? Matilda’s Mouse is having their August Clearance Event this weekend. We had the chance to go up yesterday, and as always, it was totally worth it. For the clearance event they have a ton of stuff set up outside the barn at really good prices. I think it’s a garage sale for each of the vendors. They get rid of stuff that they’ve decided they’re not going to use or no longer have the energy to refinish. 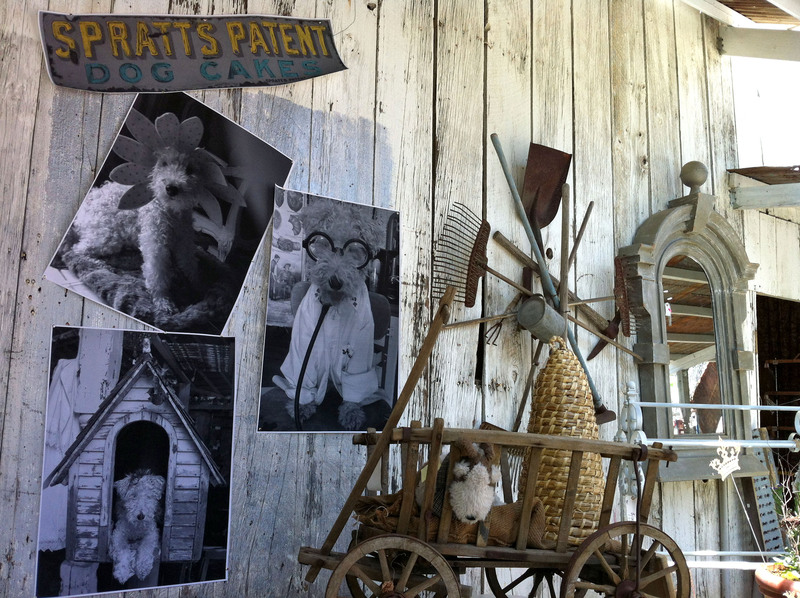 The theme of this event was “The Dog Days of Summer” so they had this adorable mural at the entrance. The mural is of Matilda herself. So cute. 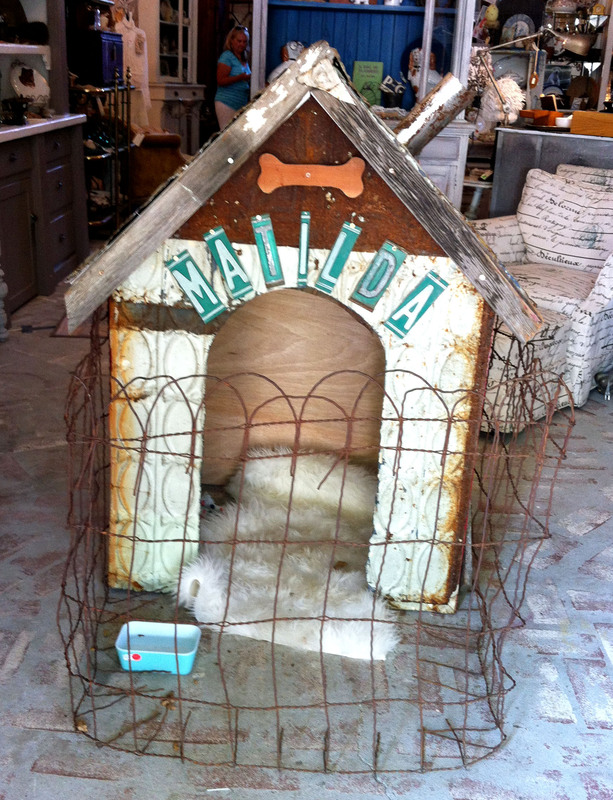 Here’s her dog house. She was on a break when we got there. Matilda is very old so it’s rare that you see her anymore. They had plenty of photos of her just in case you miss her. The barn was beautiful, as always. So much stuff to look at. 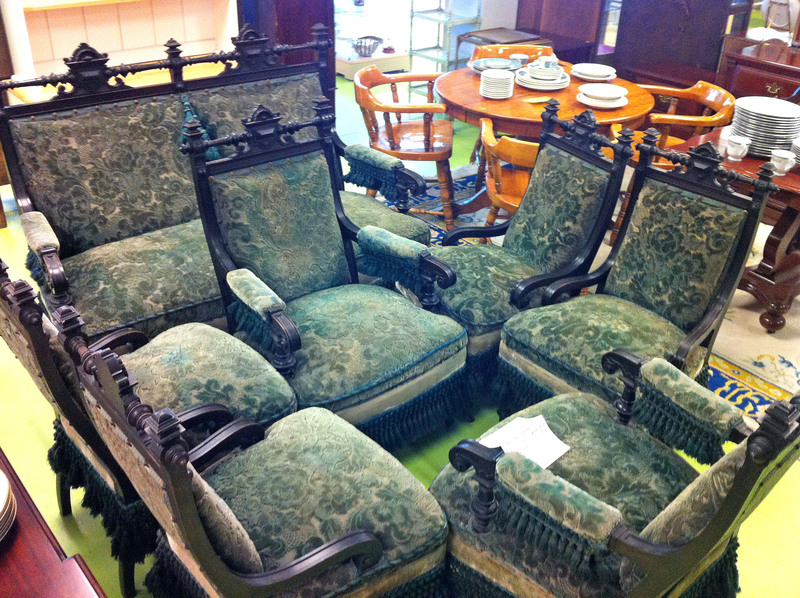 I loved this green chair, but that will have to wait for my widow house. No tufting allowed in my Husband’s-still-alive house. 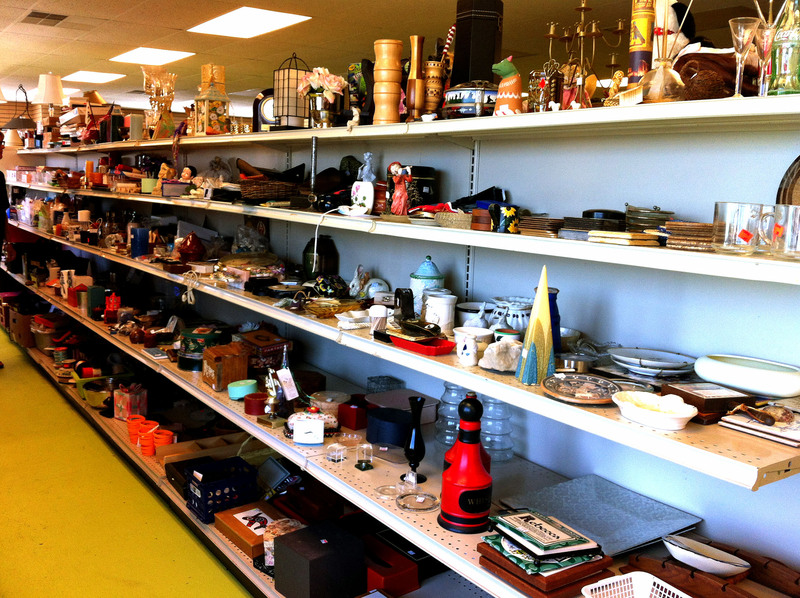 We brought home several treasures, but since they were clearance priced, we didn’t end up spending very much. The clearance event goes through Sunday if you still want to go. It’s warm this weekend but not nearly as hot as last year and they have a million fans in the barn to keep you cool. I hope you get a chance to go. It’s like a mini vacation, with awesome shopping. After my daughter’s bathroom renovation was finished, I had a lot of work to catch up on, namely, I closed the Destashio Etsy shop. 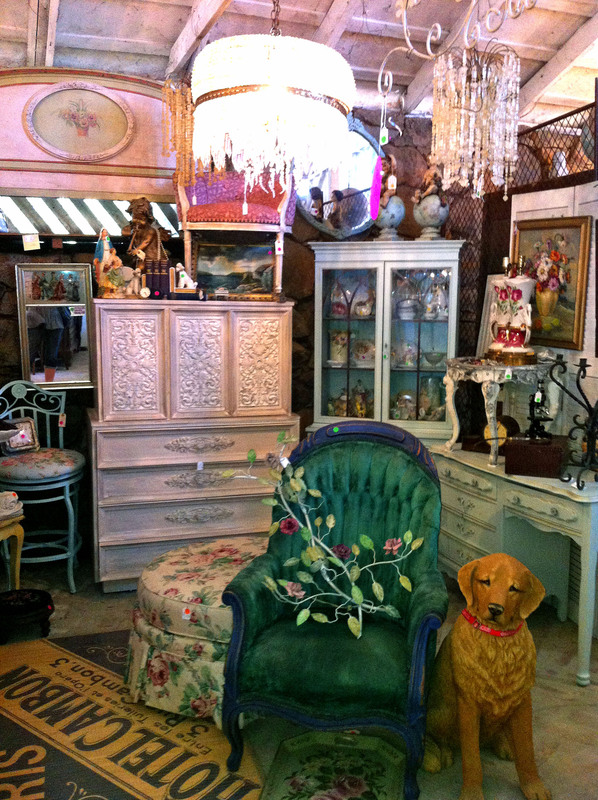 I moved any items related to storage and organization into the Salvaged Sanity shop. 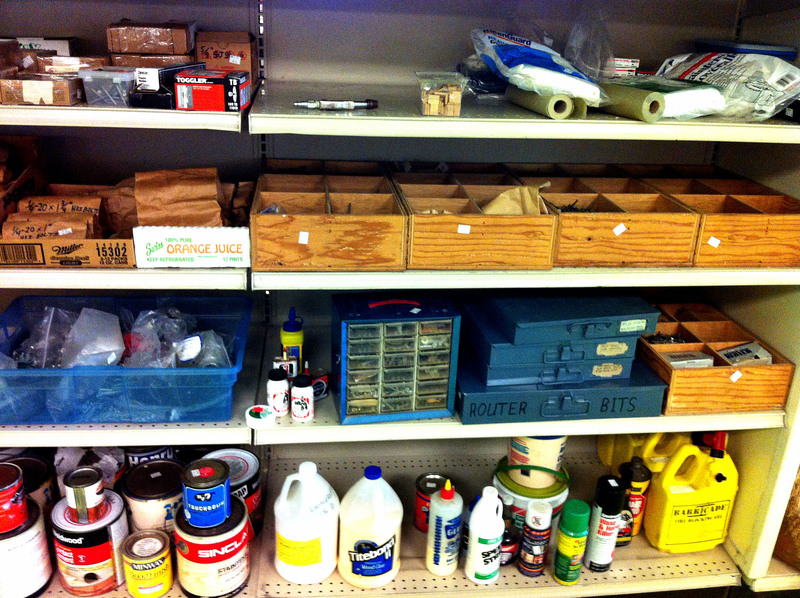 It’s been too hard to run two shops and I want to focus where my passion is……..organization and storage. This is a Message Center Board as it comes…..no accessories. This board has two 3-ring binder spines, so it can hold two mail holders, frames, or notepads in a number of combinations. There are two magnet boards at the bottom covered in a beige/blue/green floral patterned fabric. The board comes with four magnets made out of decorative bottle caps. Flanked on either side is a set of clothespins stamped with the words, “save” “date” and “remember”, to help hold on to important notes. This is what it can look like with a few additions. This is just one example but there are other options available in the shop. Adorable, Ay?! It’s a mail holder for the DIY Message Center Boards. I had a ball making this one. Totally cool! We made it to an estate sale on Friday. Really interesting sale. Let’s just say there were raw animal pelts hanging in the closets, slowly disintegrating, completely nasty. 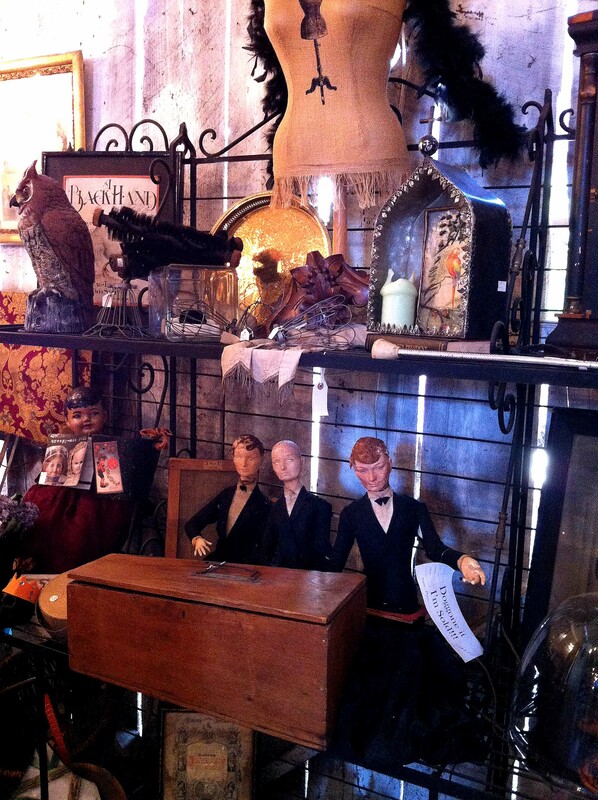 They also had a whole room of dolls, the creepy kind. I almost brought home one of those stuffed monkeys that freak me out in horror movies, but I couldn’t bring myself to touch it. I brought home the few treasures above. A couple cool frames and some neat illustrations that I can include in a new art wall I’m putting together. The little pieces of brass and the drawer pulls will end up on a board some day I’m sure. But the best thing I found was this….. This was a painting done by the former homeowner, Betty Sagan. 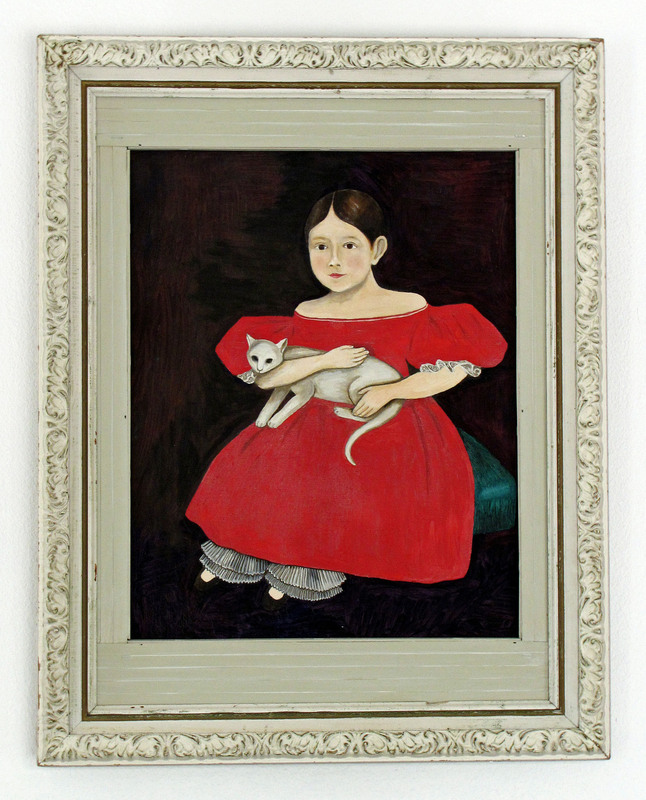 She may have had a doll fetish and a few too many animal remains to host a traditional Thanksgiving dinner, but she was also an artist. This beauty was hanging over her fireplace and I just fell in love with her. I know there is a bit of a creepy factor in her, but that’s why I grabbed her. Her daughter was so glad to see her mom’s work go to a home that appreciated her. I have her hanging right in front of me when I watch tv. Her eyes definitely follow me when I leave the room, but I appreciate the company. I have named her Priscilla and I call her cat, Fiona, and I love them completely. Don’t come over if you can’t take it. They’re precious. So that’s what I’ve been doing………what’s been keeping you busy? I know none of you are affected by good organization the way I am….this new piece I listed today makes me a little weepy. This craft supply organizer was made to organize a scrapbooker. The paper holder is made from a book that’s over 12″ wide so it can handle 12″ x 12″ papers. The washi tape holders were made from old souvenir coaster holders. The have removable dowels so you can add/subtract rolls as needed. They hold 3 standard rolls each. Plus, they’re adorable. 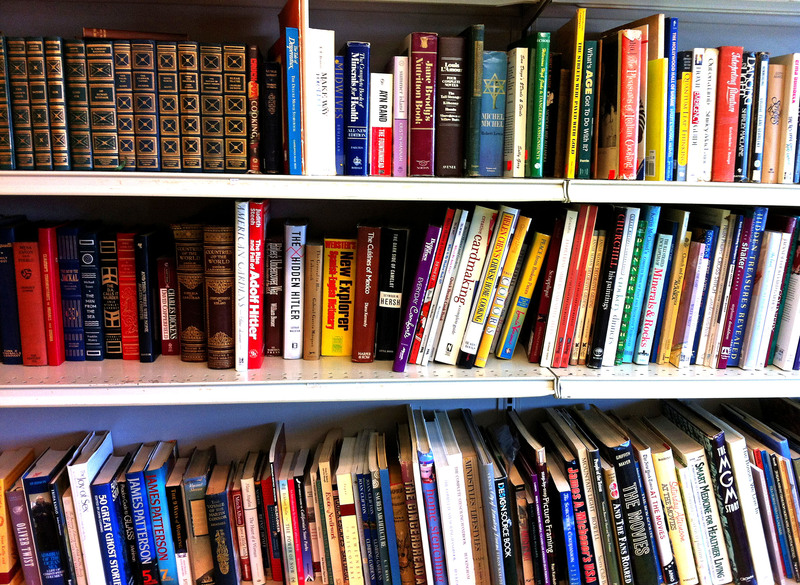 The bottom shelf is made of galvanized steel. I’m not sure what this thing was originally created for, but I snagged three of them in the salvage dept of my local Veteran’s Thrift Store. It’s plenty big and sturdy enough to hold all sorts of glue, paint and craft punches. The ribbon rack was made from an old bottle rack. I just cut them apart so they could accommodate bigger spools. They’ll hold about 4 or 5 spools each. It’s a beautiful piece. I love the color combo, the fabric of the book, but really, I just love the idea of someone organizing all their craft supplies. The peace that comes from seeing all your crap turned into beauty is priceless, right? If you’re itching to get organized, please visit my Etsy Shop. 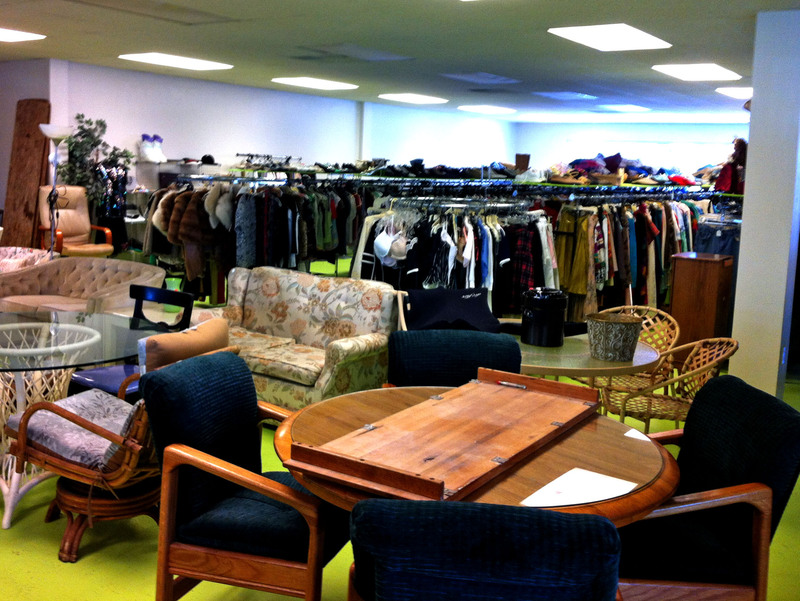 The second floor is very big, so they have more furniture, clothing racks and tons of shelving full of treasures. I picked up two big books for my organizer boards. They had some books there that were so beautiful both inside and out that I couldn’t buy them with the intention of gutting them. They’re still there if you want a really beautiful book. 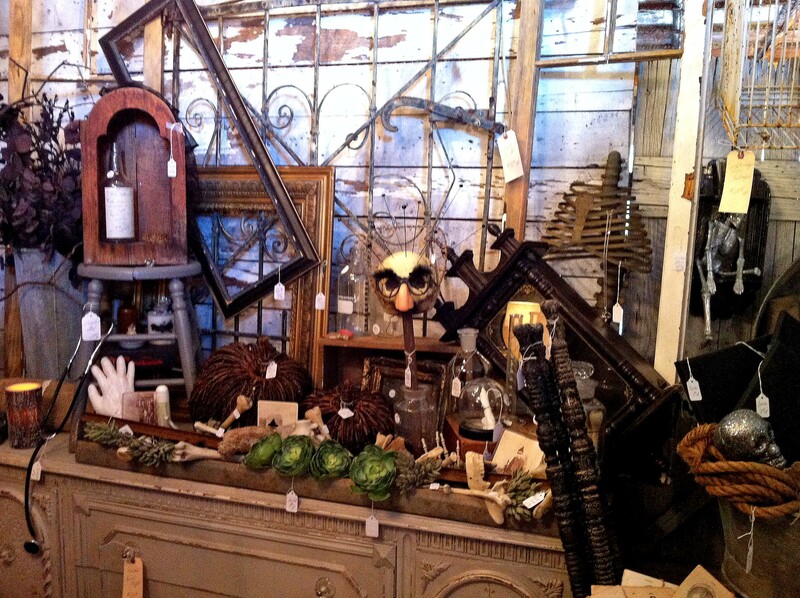 The shelves upstairs are very long and contain all sorts of awesome stuff like vintage tins, office supplies, candle holders and all sorts of flotsam that you can’t live without. 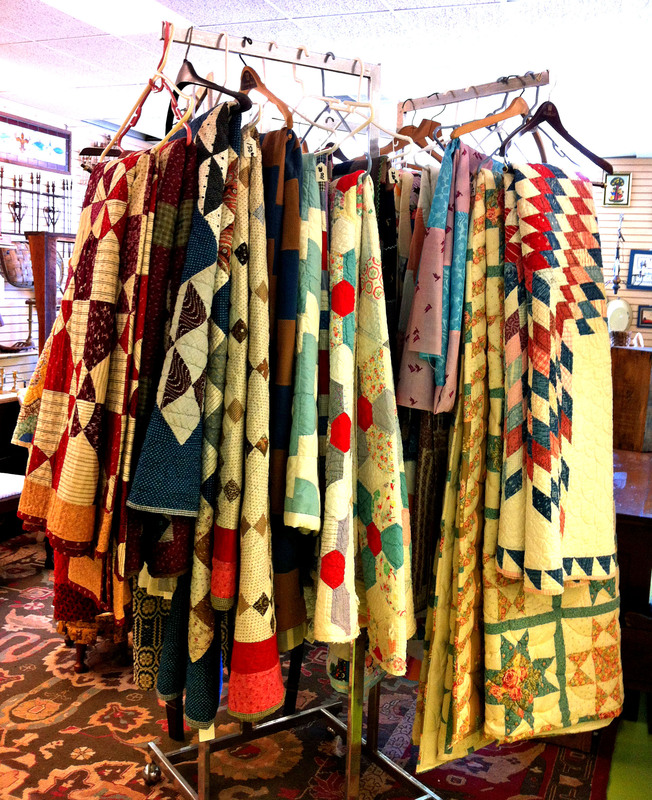 Since they’ve opened they’ve acquired many more quilts, all very beautiful. There were definitely a couple that caught my eye. 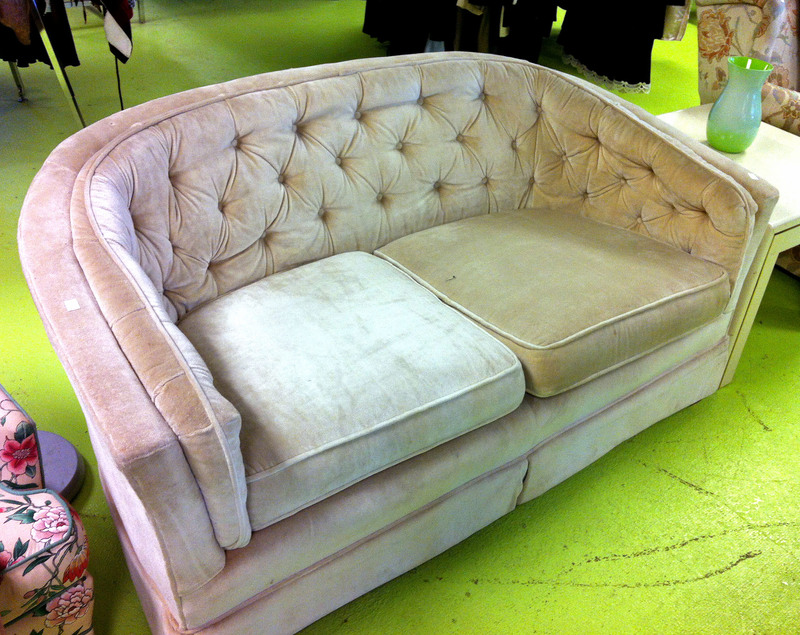 Last, but not least, they had an adorable tufted velvet sofa that would look fantastic in my Widow House. So sweet, it made me weepy. Don’t ask! Anyway……….it’s definitely worth driving out for. Also, There’s a fantastic cafe next door called Water’s. 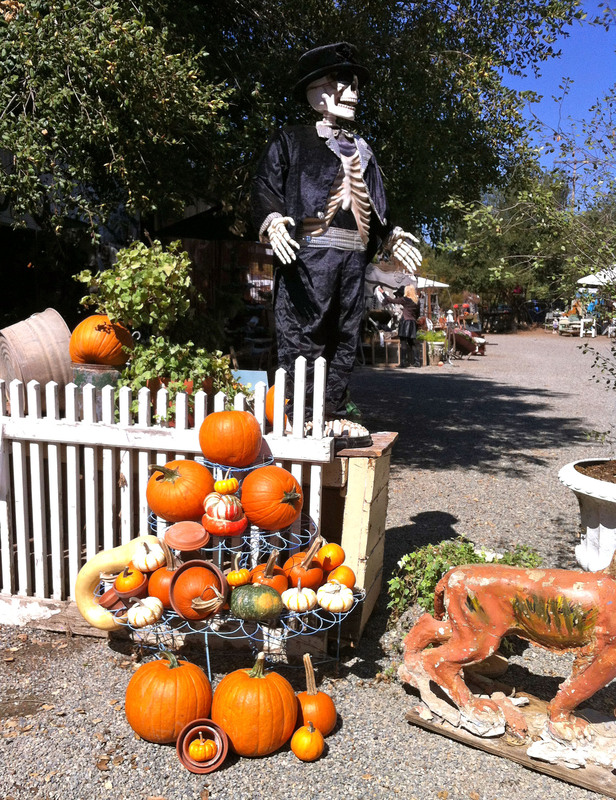 The food is organic, sustainable, California type Hippie stuff that I absolutely die for. They serve wine by the glass as well for all you lushes out there. And they let my friend and I sit there talking for hours without giving us dirty looks. I love that in a place. Hope you find the time to stop by, it’s awesome.